It’s a holiday about family, friends, food, traditions, and thankfulness — among other things. There’s something about Thanksgiving that fills us with a warmth and deeper level of happiness than we often encounter in our normal, everyday lives. 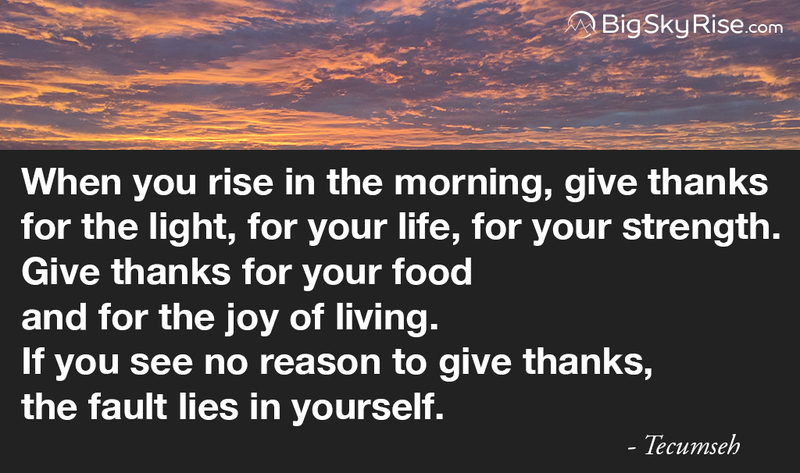 Much of that warmth and that greater level of happiness is found due the central focus of the holiday, which as is seen in its name, is feeling gratitude, giving thanks, and appreciating our life and all that we have in it. A holiday dedicated to thankfulness is brilliant, and better yet, Thanksgiving’s core theme offers a powerful model showing how we can make our daily lives better — whether you celebrate Thanksgiving or not. It demonstrates an approach to life that we can take into our everyday. An approach that reveals a greater sense of fulfillment and happiness as we walk our incredible journey. That approach is to take the time to appreciate, and be thankful for, life and all of its facets, and to cultivate a stronger sense of gratitude. While the term “gratitude” is frequently used, and most English speakers likely know the word, looking a bit beyond the dictionary definition of gratitude can be helpful in understanding it further. For this, Robert Emmons’ approach of splitting gratitude into two components is a helpful one, especially when the time comes for cultivating a greater sense of gratitude. The affirmation component is really about taking action by acknowledging and confirming the presence of good things in our life. By actively finding the good in life, whether they are big or small things, we reorient ourselves and change our perspective in a way that can help us in numerous respects. Through this action, we unleash a power that enables us to change life for the better, to heal, and to tap into the profound energy of life. The attribution component of gratitude is about actively recognizing the sources of the goodness we find. This act of attribution opens us in a couple of ways. First, it orients us to look outwards, and specifically for good things. Often, when things feel at their worst, when life feels like a burden, or when it feels like we are trapped in some form, we are inadvertently focusing inward too much, and particularly doing so in a negative manner. At the same time, when we do look outwards, it is often in a negative manner, where we tend to do things like place blame on external factors, see the world as unfair, etc. By looking outward with an eye towards the good from external factors, we can begin to break the negative cycle. We can realize that there are positive forces impacting our lives. So, while we may frequently feel like our environment throws too many hurdles at us, this action enables us to see that there are many external factors presenting us with positive things as well. Particularly for the great number of us who carry an internal dialogue that tends to be harsh and on the negative side — e.g. “How can I be so stupid?”, “I can’t do anything right.”, etc. — the act of attributing goodness can open us in a second manner. In the cases where something positive is in some form attributable to ourselves, or our own previous actions, we have the opportunity to connect with ourselves in a genuinely positive manner. We can break from the negative internal dialogue and take a moment to appreciate the good things we do for ourselves and others in a non-selfish manner. Along with giving ourselves a bit of positive reinforcement to do more good things, this allows us to really see that our own actions can be a force for good in our lives and in the lives of others. It points out the relationship to the positive actions we take and the positive consequences that can result. For so many of us, it can be easy to discard the things we do right, only to hold on to the things we do wrong. Not only is this a painful way to live, it is also counter-productive when our goal is a better life for ourselves and the world. When we acknowledge goodness from ourselves in an honest and non-conceited manner, we can more easily take lessons from the things we do wrong without carrying a negative — and often defeatist — internal energy that drains us of the power to do good. So what can gratitude do for you? Well, much like the numerous and growing list of scientifically backed benefits to mindfulness, the list of benefits tied to greater gratitude is long and growing. In a broad sense, everything from your relationships, social well-being, psychological health, and physical health, to your overall happiness levels, improve with greater levels of gratitude. More specifically, the many forms of goodness that gratitude brings you are well-researched and covered across the web. Additionally, this quick-to-read article on Forbes covering 7 scientifically proven benefits of gratitude touches on a number of life areas improved by the power of greater gratitude. The impact of expressing gratitude on a person’s levels of happiness is quite impressive, as is touched in this fascinating video. More so, it’s interesting to note the powerful emotional impact that comes from simply watching the experience and expression of gratitude in others. With the quickly expanding world of scientific research on gratitude and its effects, there are plenty of helpful and informative insights and lessons to be found. Amit Amin provides an excellent look at a number of studies and key takeaways in his article The science of gratitude: More benefits than expected; 26 studies and counting. Even though those are just a fraction of the studies and articles available on the topic of gratitude, and while reading such things can prove quite beneficial, the best way to really understand what gratitude can do for you is to experience the effects first hand. Just like when you want to cultivate greater mindfulness, there are numerous ways to grow a greater sense of gratitude, and there are plenty of techniques and strategies you can follow. Starting in the broadest and most straightforward sense, simply beginning to look for ways to be grateful sows the seeds for a life of greater gratitude. Pause, breathe, and actively look for the things in life for which you can be grateful. Those things can be small or large. They can be materialistic or not — though in the long run you’ll get more from the non-materialistic things. At this stage, there isn’t really a right or wrong; what’s important is the looking. When looking, consider things as fundamental as the breath you are taking right now; the shelter you live in; having a bed to sleep in; the access you have to technology that connects you with people around the world; your ability to see, hear, feel, taste, touch, etc. ; your ability to read and write; and the simple fact that you are alive right now — which in itself is an opportunity for better things, even when life may not feel so great at the moment. These are all very basic parts of life, which we frequently take for granted, even though there are people who do not possess each one. Yet, each of these truly provides us with many wonders, and in situations where one of these things is no longer available to us, we certainly miss it. Beyond this initial approach for growing gratitude, there are a number of simple techniques you can adopt into your daily living, and which can prove transformative. A number of upcoming posts are dedicated to exploring some specifics of gratitude further. Part of what makes the Thanksgiving holiday so great is that it encourages us to take a moment to really appreciate the good things in life. From there, we can make our everyday life better by taking the heart of the Thanksgiving message beyond a single November day and into our daily lives. Gratitude is incredibly powerful and transformative in many respects, so growing our gratitude can go far in helping each of us live a happier, more fulfilling life. There is always something to be grateful for, even in the hard times. Find, appreciate, and be thankful for it. You’ll be empowered by actively being grateful, and life will be a bit brighter.